Sarasota Bay is a pristine body of water on the west coast of Florida. Despite the development, fishing is very good year-round for a variety of species using multiple techniques for anglers booking Sarasota fishing charters while in Florida. Live bait and artificial lures produce well, and fly fishermen will also have success. The bay is fairly shallow, with the depth rarely exceeding ten feet. Lush grass flats cover many acres of bottom and are the key to life as they provide cover for shrimp, crabs, and baitfish. This in turn attracts the gamefish! Two passes connect Sarasota Bay with the Gulf of Mexico are are also great spots to try as fish migrate through. The inshore Gulf of Mexico can provide world-class angling when conditions are right. The technique that produces the best action throughout the year on Sarasota fishing charters is fishing the “deep” grass flats in Sarasota Bay. These are areas between five feet and ten feet deep that have grass growing on the bottom. Such areas hold good numbers of speckled trout and ladyfish all year long as well as migratory species such as Spanish mackerel, bluefish, pompano, sharks, snapper, grouper, jacks, and cobia. Drifting the flats with the wind while casting out a leadhead jig or live shrimp works very well. In the summertime hordes of small baitfish inhabit Sarasota Bay. This live bait is cast-netted up and used as “chum” to attract the gamefish in behind the anchored boat. The action can be non-stop! These techniques are easy for anglers of all ages and skill levels to enjoy. Both Big Sarasota Pass and New Pass offer fantastic fishing at certain times of year. Sheepshead move in from Jan to April and are caught using shrimp on the bottom near the abundant structure. These tasty saltwater panfish school up in huge numbers and are easy to catch. Snapper and grouper are also landed. Drifting the pass with live bait or while bouncing a jig on the bottom produces a lot of fish throughout the year. 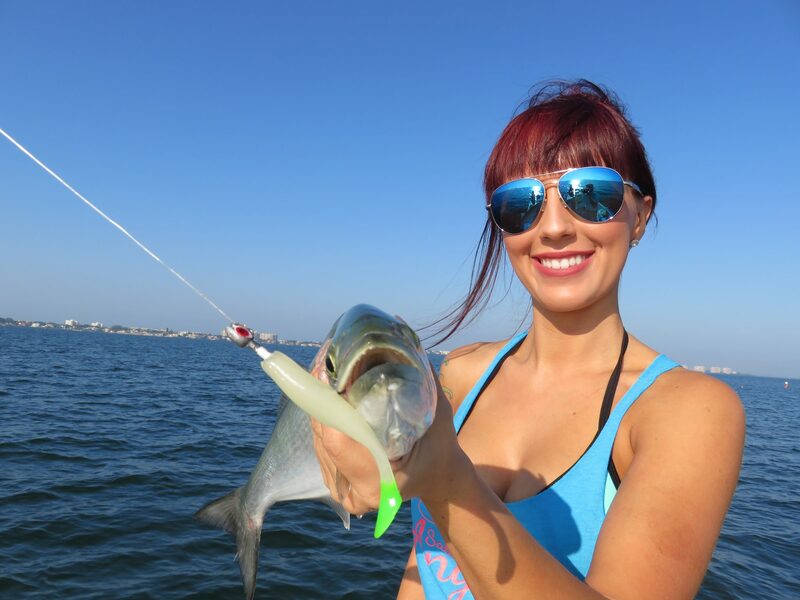 Ladyfish are most numerous, but pompano, mackerel, bluefish, jacks, and other species will also be caught. 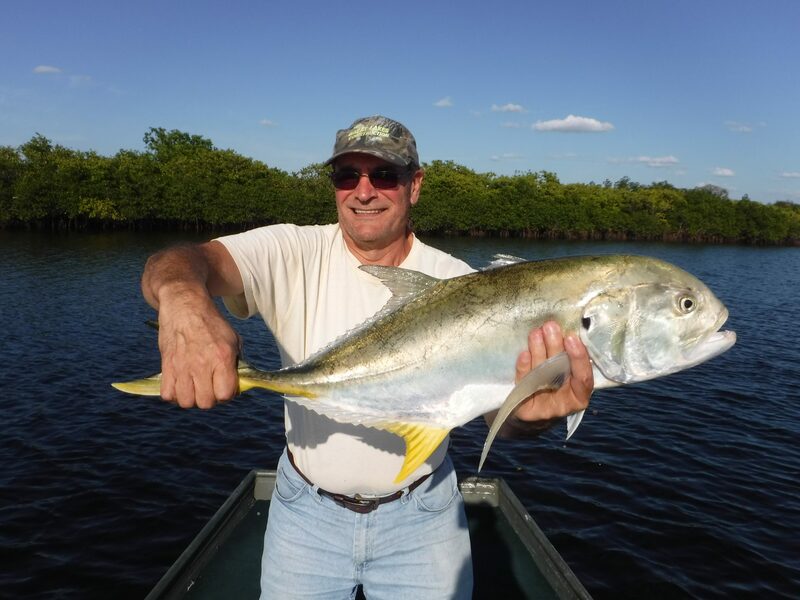 More experienced anglers seeking a bit more challenging experience on Sarasota fishing charters may opt to target snook, redfish, and jack crevelle. These fish are caught by clients casting lures such as Rapala plugs and Bass Assassin jigs towards likely looking structure as the boat eases down a shoreline. Mangroves, oyster bars, docks, seawalls, and other structure will hold fish. Creeks and canals are good spots in the cooler months as fish migrate up into them as they seek warmer water. Phillippi Creek in particular holds a lot of snook and jacks in the winter. Migratory species such as Spanish and king mackerel, false albacore, tarpon, sharks, and cobia move along the Gulf Coast of Florida, usually following massive schools of baitfish. When conditions are right, east winds, calm seas, and clear water, the action can be nothing short of fantastic! Much of the time the action can be seen on the surface as mackerel and albies terrorize helpless baitfish. In this situation, just about any lure of fly that resembles a baitfish will get devoured. This is incredibly exciting fishing and can produce trophy fish! On days that the fish do not show on the surface, trolling spoons and plugs can help locate the. There are also several artificial reefs off of Lido Key that provide great action on these species as well as bottom fishing for sheepshead, grouper, and snapper. Capt. Jim offers a unique fishing charter option to anglers visiting Sarasota. There are several nearby rivers which can offer clients to chance to catch a trophy snook! The Myakka River, Manatee River, and Braden River are all a half hours drive or so away from Sarasota and the beaches. River fishing charters provide clients not only with the trophy snook opportunity, but also some fantastic scenery. It is a chance to experience old Florida. River fishing charters are best for anglers that have some experience. This is not a numbers game it is more about going for couple quality fish. Smaller snook will certainly be landed, and there days when anglers catch a dozen fish. However most of the time the goal is one or two large fish. Therefore, decent casting skills along with some patients are required for these trips. Several other species are landed on River fishing charters as well. Largemouth bass, large Jack crevelle, juvenile tarpon, gar, catfish, redfish, and sunshine bass will all hit lures meant for the mighty snook. It is pretty cool to catch a largemouth bass on one cast and a snook on the next! Q: Do visiting anglers to Sarasota need a fishing license? A: Clients going out on Sarasota fishing charters do not need a license. The state of Florida has a provision whereby licensed charter boat captains purchase a license for their guests. This makes it very convenient for clients as they don’t have to go through the purchasing process. However, visiting anglers fishing from shore, bridges, and rental boats do need to purchase a Florida fishing license. There are some exceptions based on age and other factors. Click HERE for current regulations and to purchase a license if needed. Q: How much do Sarasota fishing charters cost and what is included? A: A four hour fishing charter for 1-4 anglers is $400. A four hour charter is plenty for most gas, especially with novice anglers and children. Longer trips can be arranged for the more seasoned angler. Capt. Jim provides clients with all fishing tackle, bait, a cooler with ice, the boat, and his experience and service. Clients may pay for the charter with cash, check, or major credit card. Q: Where do Sarasota fishing charters depart and at what time? A: Capt. Jim likes to leave from the public boat ramp at Centennial Park, in downtown Sarasota. This is a very central location, ideal for accessing the good fishing spots both North and South. It is also very close to the Gulf of Mexico when conditions dictate. Most charters will leave in the morning, somewhere around 7:30 AM. However time may be changed depending on conditions such as weather, time of year, and tides. 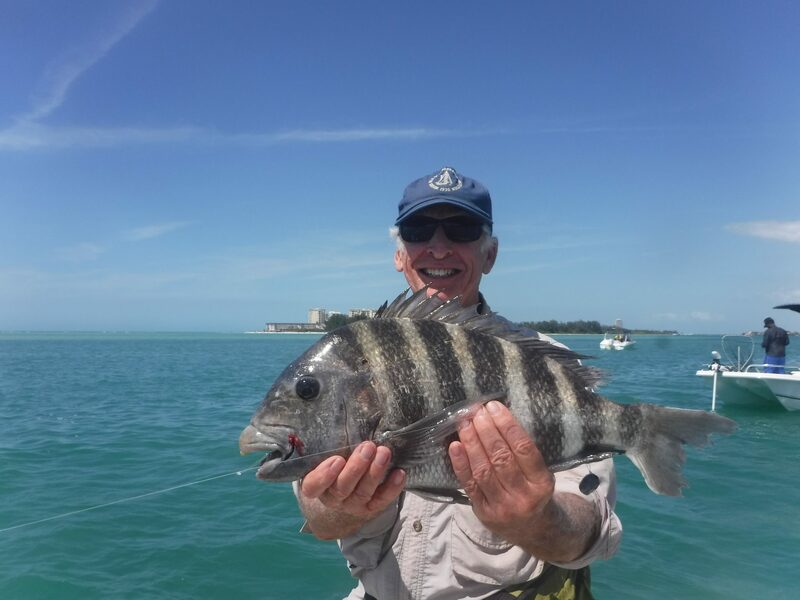 Q: What kind of fish are caught on Sarasota fishing charters? A: Sarasota offers visiting anglers a wide variety of fish species that can be targeted and caught throughout the year. 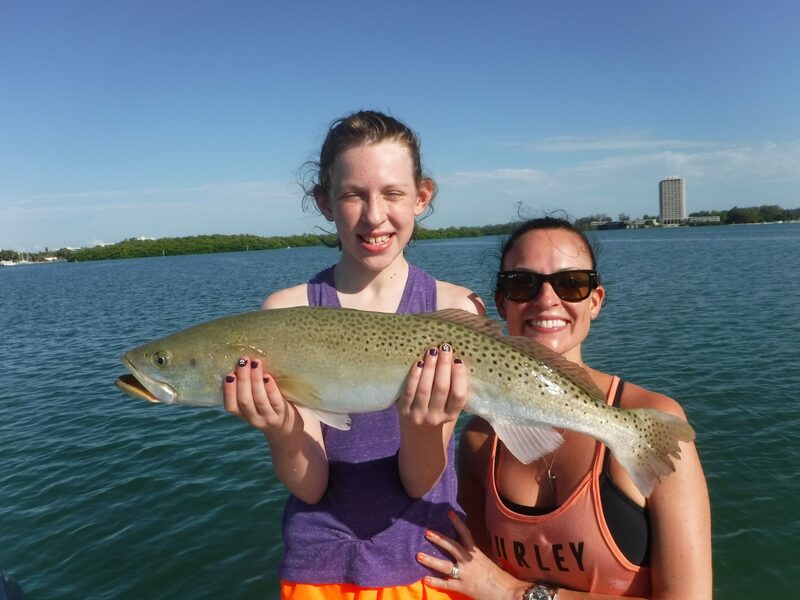 Speckled trout, Spanish mackerel, bluefish, Pompano, ladyfish, flounder, black Seabass, catfish, cobia, and sharks are caught on the deep grass flats and in the passes. Sheepshead, snapper, grouper, and black drum are caught near structure such as docs, bridges, and rocks. Snook, redfish, and Jack Gravelle are caught by more experienced anglers casting Lords to mangrove shorelines and structure. False albacore, mackerel, and tarpon are available in the inshore Gulf of Mexico. Q: Can clients keep fish on Sarasota fishing charters? A: Yes, they may. While Capt. Jim does strenuously advocate catch and release, he understands that for many anglers a fresh fish dinner is desired. It is fine for clients to keep enough for a meal. However, the days of loading coolers and taking a bunch of fish are over. Capt. Jim will gladly filet and bag up your catch for you at the end of the trip. 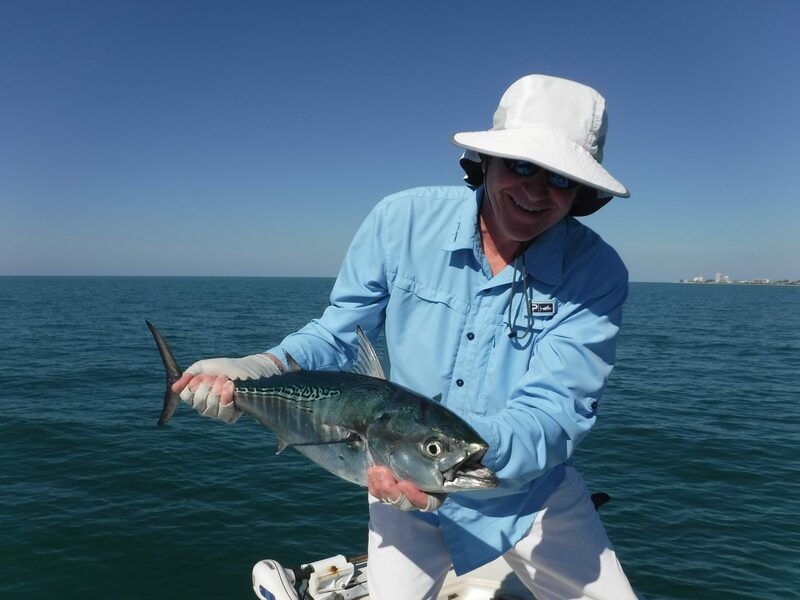 Q: What do clients need to bring on a Sarasota fishing charter? A: Guests should show up with appropriate clothing for the weather, comfortable shoes with white soles, hats, drinks, snacks, and sun screen. Capt Jim will provide all fishing tackle and bait. Also, a cooler with ice and extra waters will be provided.